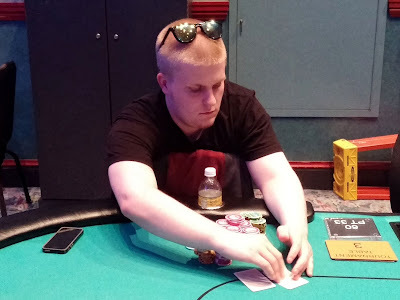 Jack D'Agostino was all in preflop holding [Ac][Kd] and was up against Daniel McCoy's [Ts][Th]. Jack failed to out-race his opponent, and he will exit the tournament in 12th place, good for $10,142. Alex Cukar was crippled earlier when he ran his A-K into his opponent's pocket aces. He was just eliminated in 13th place when he ran trip tens into his opponent's trip tens with a bigger kicker. The one time chip leader will collect $8,268 for his efforts. On a [7c][Tc][2c] flop, Dena Pearlman was all in holding [Ac][Qs] and was called by Daniel McCoy holding [Kc][Kd]. 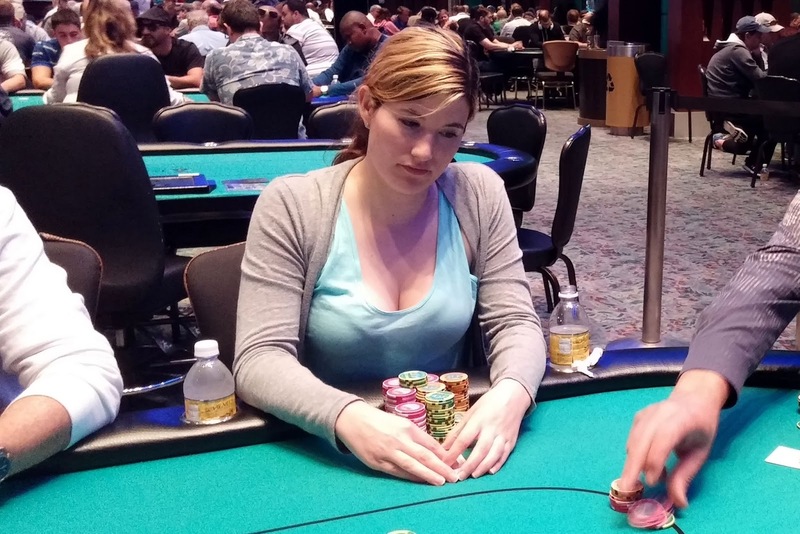 Dena had a flush draw to go with her overcard, but failed to hit on the [9d] turn or [4h] river. Dena will exit the tournament in 14th place, good for $8,268. 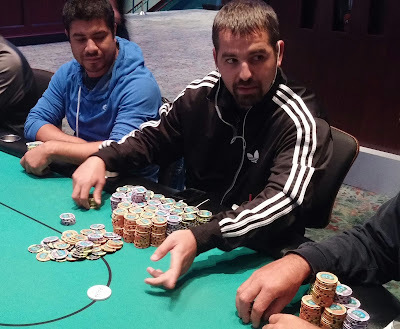 Brad St. Vincent open shoved for a little over 400,000 and Joseph Corrente called all in for less. Firas Haddad called both all ins, and the rest of the players folded. Firas was in great shape to knock out two players, and the [4h][6s][Qs] flop was no help to either allin player. The [4c] turn meant both were drawing dead, and the [7d] hit the river to seal the deal. Brad had more chips going into the hand, so he will take 15th place for $8,268 while Joseph will take 16th place for $6,813. 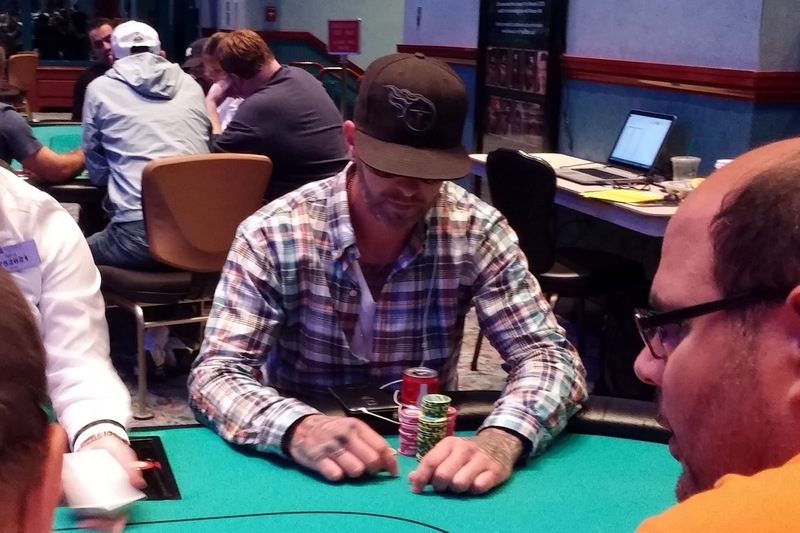 While waiting for a player to be brought from the other table to balance, Donald Lohr tripled up with pocket kings and was then moved to Brad's seat. 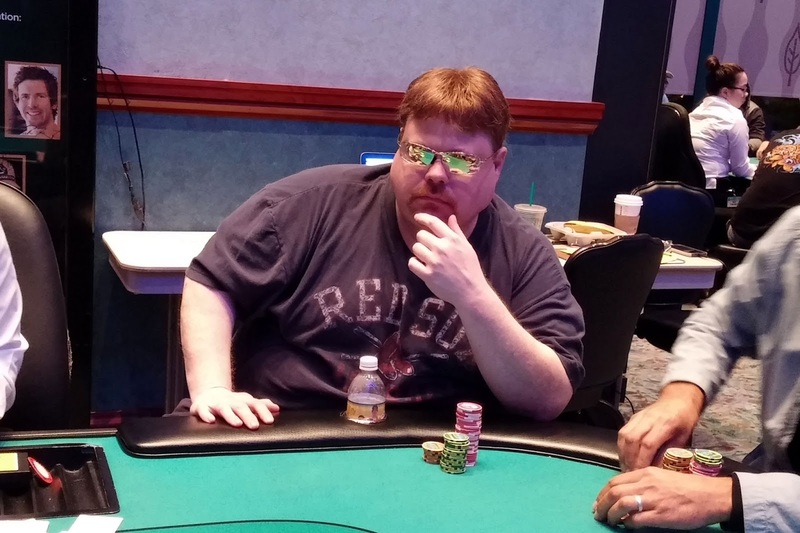 Robert Hankins was all in and at risk holding [Ac][7d] and was up against Firas Haddad's [4h][4d]. 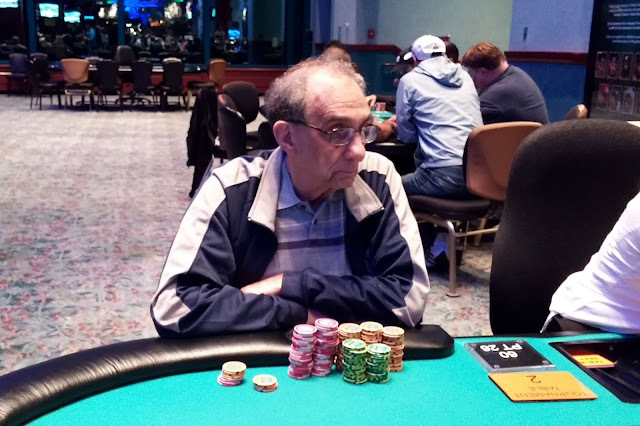 It was a race for Robert's tournament life, and the [Jh][8d][6d] flop was no help. The [Kh] changed nothing, but the [Ah] on the river was just what Robert needed. He will double up to around 700,000. At 15,000/30,000 blinds, Firas Haddad opened to 75,000 before David Chaves moved all in for 120,000. 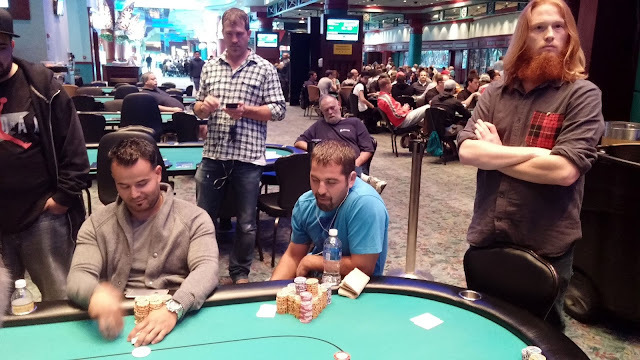 Right behind him on the button, Daniel McCoy reraised to 250,000, and Firas thought for a moment before folding. Daniel's ace high held through the [6h][3c][5c][3d][5h] board, and David will be eliminated in 17th place, good for $6,813. Kenneth Rawlinson has been eliminated in 19th place when his [Ad][6c] fell to Alex Cukar's [Ks][Jh]. 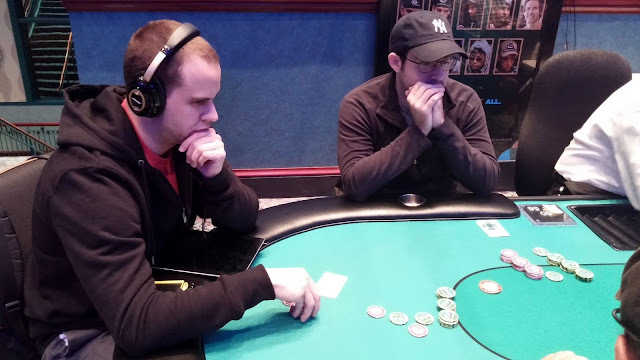 Alex flopped a pair on the [2d][4h][Kc] flop, and stayed in front on the [4d] turn and [4s] river. With Kenneth's elimination, we have reached the final 2 tables. The remaining 18 players are now redrawing for seats, and play will resume shortly. We will have full chip counts and seating assignments shortly. With the elimination of Donald Russell in 37th place, we are now down to the final four tables in Event #1 $580 NLH. Still alive in the field are Brad St. Vincent, Je Wook Oh, Dena Pearlman, and Mark Perry. Players will be taking a dinner break after this level, and we will do our best to get chip counts for as many players as possible at that point. 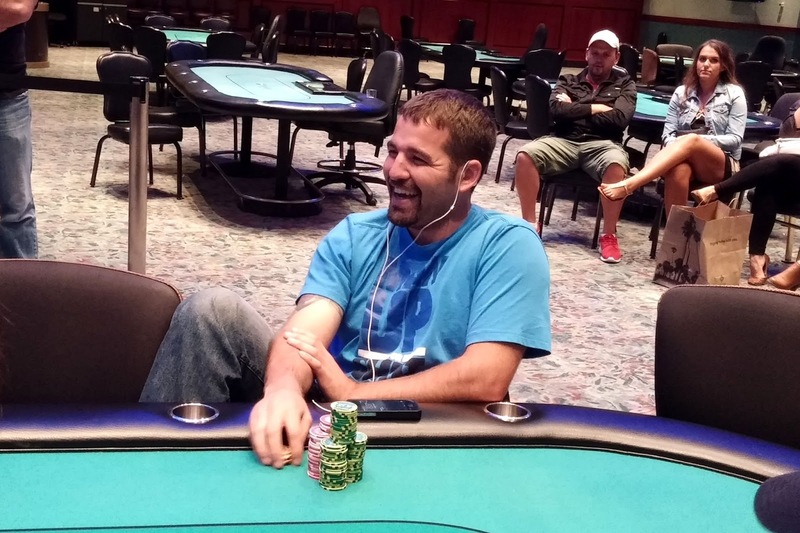 At 2,000/4,000 with a 500 ante, the button opened to 15,000 and Alex Cukar called from the small blind. The big blind went all in for another 30,000, and both players called. Alex and the button checked all the way down on a [6d][8s][5d][4d][3h] board, and Alex declared "straight" as he opened [2d][2c]. The all in player mucked his [Jh][Th], and the bubble has been burst. The remaining 153 players are now in the money, guaranteed a $985 payday. 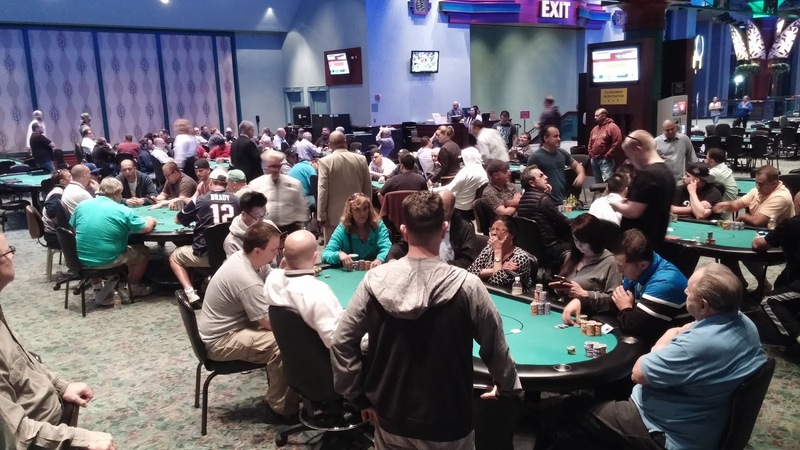 155 players remain in Event #1, and the top 153 players will make the money. Play is being held up at all tables, and once all hands are complete, the tournament will be hand for hand. At the same time, Event #2 and Day 2 of Event #1 have gotten cards in the air. Day 3 at the World Series of Poker Circuit has officially begun. You can watch the live stream of Event #2 at www.FoxwoodsLive.com. Registration will remain open until the start of level 9 (approximately 4:20pm). There is a dinner break after Level 12 (approximately 6:20pm). With 10 minutes left on the clock, the tournament staff has announced that the field will play 3 more hands in Flight D. The board reads 74 players remaining, and the surviving players will join the survivors from the other 3 flights for Day 2 at 12pm EST. Full chip counts and seating assignments will be posted overnight. There are 85 players remaining in Flight D from the 507 that begun the day. 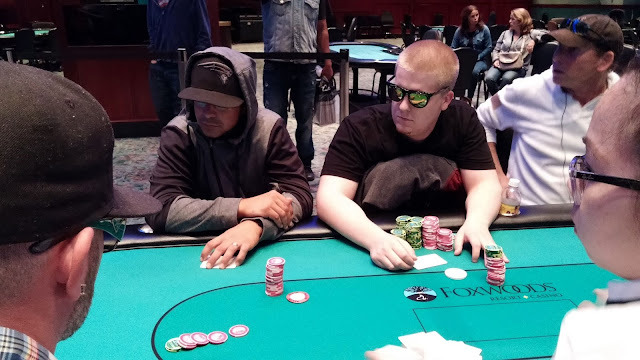 Level 14 (1,200/2,400 blinds with a 400 ante) is coming to an end, which means the field will play one more level before bagging up their chips for the night. The chip leader from Flight D is Alex Cukar (pictured above). When we arrived to count his chips, he was eliminating a player with a set of eights against a flush draw. From the table talk, Alex is on a hot streak and can't lose a hand. He now sits on 312,000.